The Australian tropical rainforests contain over 2,700 species of higher plants, representing more than 10% of the Australian flora. These rainforests stretch from the lowland and montane tropical rainforests of northeast Queensland through to the drier and monsoonal rainforests of the Northern Territory and the Kimberley district of Western Australia. The rain forests of the Wet Tropics area of north east Queensland are the most species rich, with over 2,250 species. There is a decrease in species richness along the rainfall gradient to the monsoonal rainforests of Western Australia, where there are 362 species. Two online keys are now available to facilitate the identification of this vast and diverse flora. 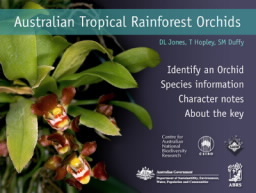 The Australian Tropical Rain Forest Plants – Edition 6 and the Australian Tropical Rainforest Orchids are interactive multiple-entry identification and information systems, where the user decides which characters to choose based on the specimen in hand, and were launched in December 2010. The latest edition of the Australian Tropical Rain Forest Plants Key includes 2,553 species of trees, shrubs and vines, grasses, sedges, palms, pandans and epiphytes of northern Australian rain forests, and is believed to be the most comprehensive interactive key ever produced. A total of 173 characters, covering morphology – habit, bark, leaves, flowers, fruits and seedlings and some geographic and ecological information ensure reliability and power of the key is high. New features, including presence of leaf glands, weediness and plant nutritional strategy have been added, whilst improved illustrated help notes assist with interpretation of characters. Plant images help to confirm identification.